DNA testing shows that Indonesia’s most wanted terror suspect, Noordin Top, was not killed in an 18-hour raid in Central Java during the weekend, national police said on Wednesday. Law enforcement sources told CNN on Saturday that Noordin was dead, but doubts emerged a short time later. Police never officially said he had been killed, but it was widely reported that he was dead. The sources said Noordin was killed during a Detachment 88 raid that began Friday in the Central Java town of Temanggung and lasted 18 hours into Saturday. The information came from a police source and a security analyst with close ties to the police. Noordin is reportedly an officer, recruiter, bomb-maker and trainer for a splinter group of the militant organization Jemaah Islamiyah, which has ties to al Qaeda. Police have hunted for Noordin for years, accusing him of involvement in the 2002 Bali nightclub bombing and attacks on the Marriott hotel in Jakarta in 2003 and Australian embassy in 2004. 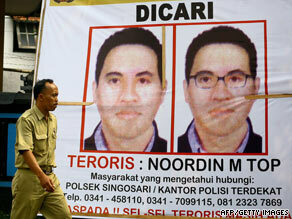 Police have said Noordin was the main suspect in the Jakarta hotel bombings last month. The FBI in the United States added Noordin in February 2006 to its list of 10 suspected terrorists who have not been charged in the United States but are wanted for questioning.